After infection or vaccination, B cells that recognize the pathogen proliferate and undergo a massive level of expansion. Upon clearance of the infection a small fraction of the "best" B cells are retained to become memory B cells or long-lived plasma cells. 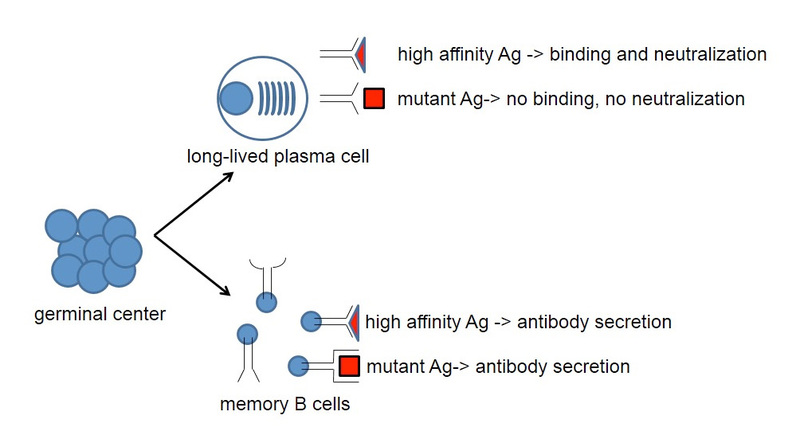 Long-lived plasma cells constitutively secrete antibody to neutralize pathogens immediately upon reinfection, whereas memory B cells produce antibody only upon re-stimulation by specific antigen. Although pre-existing serum antibody titers correlate with vaccine efficacy, the importance of the memory B cell response in conferring protection to reinfection has remained controversial. As both long-lived plasma cells and memory B cells have been retained through mammalian evolution, these cell types must have distinct functions that remain to be fully delineated. Our recent work has established that memory B cells are excellent at recognizing not only the original pathogen, but also mutant escape variants of the pathogen. In contrast, long-lived plasma cells are highly specific only for the original pathogen. We are studying the affinity maturation process that allows such cross-reactive cells to emerge, and are studying mechanisms to alter this fate to provide effective immunity against mutable viruses such as influenza and Dengue.